Ernst & Young, the global consulting giant, said that it expects investor sentiment towards Sub-Saharan Africa to remain soft, as foreign direct investment will slow over the next few years. In the year-end update to its Africa Attractiveness Programme released on 7 December 2016, EY said the weakening investor sentiment towards SSA will be due to heightened geopolitical uncertainty around the world and greater risk aversion rather than the region’s deteriorating economic fundamentals. Beneath the averages and headlines, the growth dynamics across different individual countries and sub-regions are very mixed. 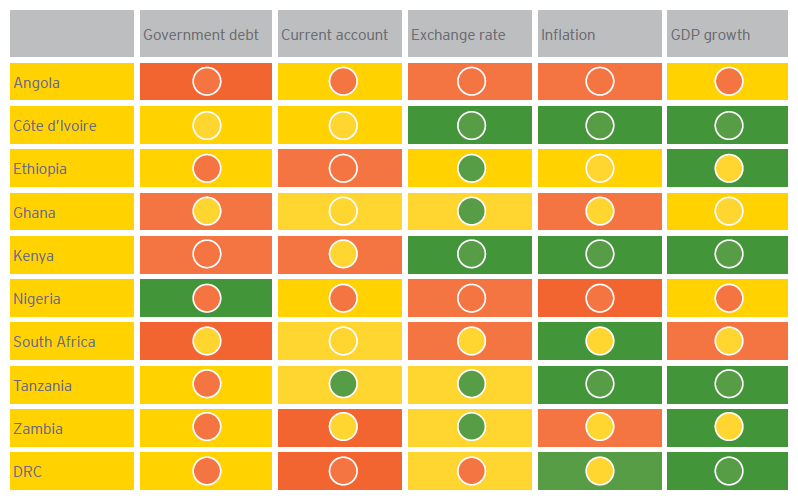 The 'heatmap' below provides a snapshot of macroeconomic resilience across some of the key sub-Saharan African economies, and illustrates just how variable economic performance is across different parts of the continent. The color of each block represents the longer-term position for that metric - green being positive and red negative. The color of the circle in the block represents the current trend. It is clear from this illustration that the three largest economies in sub-Saharan Africa - Angola, Nigeria and South Africa - remain under pressure. In the six months since March 2016, the position of Angola and Nigeria in particular has deteriorated, with the Nigerian economy entering a recession and Angola forecast to register zero growth this year. Sustained low oil prices, and the subsequent deteriorating terms of trade that both economies have experienced since 2014, have led to a growing current account deficit and rising government debt levels. Although growth in South Africa remains low, there have been some improvements in key macro-economic indicators in the past six months - including the current account deficit and a somewhat stronger currency. This indicates at the very least that the economy has stabilised, and may in fact be a signal of a gradual recovery. At the same time, and in contrast to challenging economic conditions in the big three, many of the East African and Francophone economies have remained resilient. Kenya, Ethiopia, Tanzania, Cote d'Ivoire and Senegal are among the African economies still expected to grow in the high single digits this year and next (and through 2021). This partly has to do with the major exports of many of these economies being less impacted by declining terms of trade. In addition, investment in infrastructure, domestic consumer spending and the continued evolution of services and manufacturing, continues to spur growth in these economies. The key to overcoming weak global demand lies in enhancing diversification policies. Economies that span a broad range of sectors tend to fare stronger in such periods. Nigeria and Angola provide strong evidence of reliance on a single commodity, as both economies either face or are already in recession. The resilience in certain African economies reinforces the need to accelerate the process of diversification in others. Diversification clearly requires structural economic reforms, and each country is at a different point along this path. This provides enormous opportunity for growth across the region, as investors respond to pragmatic policy reforms and seek opportunities across growing consumer, services and industrial sectors. This article is an abstract from EY’s ‘Africa Attractiveness Program 2016: Year end update’.